I don't know what gallery to put this in so I put it here. It is a small scene, not a "landscape". Winter Lake Huron shoreline ice formations are dynamic - constantly changing. Here icicles formed from the top of a very small beach cave as a result of wave action entering the cave. Many formed while there was a steady wind coming from the right, so they are bent. Then the wave action changed during very cold conditions: water entered the cave much less violently and less often, with gentle undulations. So the icicles were "dipped" in water every so often. The ice formations pictured were the result. Nice image. Interesting formation. Looks like an abstract water color art. 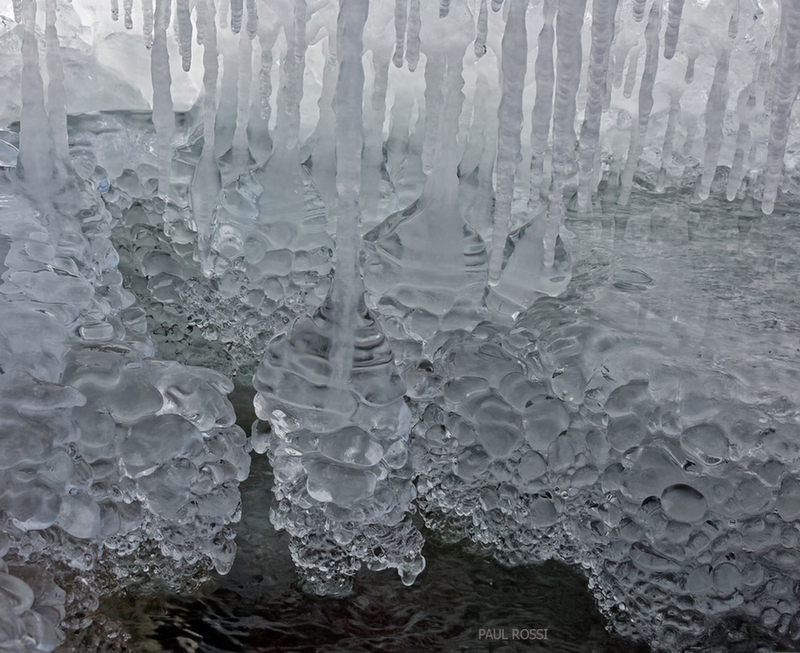 Neat array of icicles, an intimate landscape (icescape?) - it's fine to post it here. A beautiful and most intriguing image! I've often thought of images we shoot like this as 'macroscapes'; unfortunately, that word is used in many other ways, including in the financial industry.